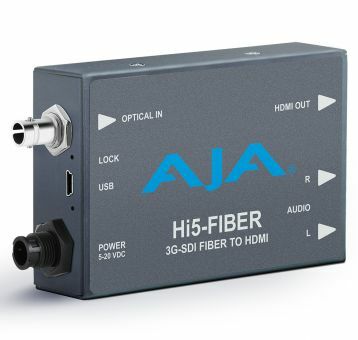 Hi5-Fiber converts 3G-SDI over single mode 1310 nm Fiber optic cable (ST-style Fiber connector) to HDMI for driving HDMI monitors. Embedded 8-channel 3G-SDI audio is supported in the HDMI output allowing a convenient single cable audio/video connection. Hi5-Fiber provides 2-Channel RCA style audio outputs for separate audio monitoring if needed.